Californian musicians Ryan Merchant and Sebu Simonian first met on Craigslist, started composing music for TV commercials and eventually decided to start a band. That band is Capital Cities. Their single, Safe and Sound, hit the internet a couple of years ago and sounded like a long lost brother to Girls Aloud's The Loving Kind. With the release of their debut album, In A Tidal Wave Of Mystery, around the corner, the pair are finally putting Safe and Sound out as a single in the UK later on this month. They are also launching the album with a show at XOYO next week. Londonist got probesome with Ryan and here's what he had to say for himself. Howdy-do-thee, Ryan! You're releasing Safe and Sound in the UK and not a moment too soon, it has to be said! Is that the first thing you and Sebu did together? Safe and Sound was one of the first songs we wrote together, yes. It was initially composed in 2009 but took a year and a half and 8 different productions before being released. You've managed to create an album with zero stinkers on it. What was the creative process like for it? Sebu and I split the songwriting process 50/50. We both play multiple instruments, program drums and write lyrics and melody. Usually a song will start with a beat/chord progression that one of us has created on our own. From there we sit down for hours together and riff melodically and lyrically until we come up with something that both of us agree is unique, catchy and cool. Then we begin the painstaking process of crafting a full song. The album was self-produced by the two of us, however, there were a number of talented people that contributed to make it what it is. Manny Quintero on Bass. Nick Merwin on Guitar. Spencer Ludwig on Trumpet. Vocal features from André 3000, Shemika Secrest and Soseh. How did your collaboration with Andre 3000 come about? Our manager sent him the track. He loved it and graciously recorded a verse for us. To our ears, there is a distinct European pop feel to the album, rather than a West Coast sensibility. Do you agree with that assessment? Actually, a lot of people think that our music has a distinctly "California" sound. We had no intention with our music besides the desire to write fun, creative songs that we enjoy ourselves. Both the video for your next US single, Kangaroo Court, and the promo for Safe and Sound are brilliant and have clearly had a lot of thought put into them. Do you come up with treatments yourselves? The concept for Safe and Sound is based on a DIY video we made when we first released Safe and Sound, that juxtaposed stock footage of dancing and war over the course of the 20th century. When we signed to Capitol Records they felt we needed a live action video showing our faces and we agreed as long as it was a cool idea. Someone submitted a treatment that was loosely based on our DIY video minus the war footage which eventually became what is now the official video. You were nominated for two awards and the Safe and Sound video even won one at this years VMAs. How important are such accolades to you? It's an honor to get an award like this, but it certainly doesn't make us feel like we've "made it". Having fans from around the world tell us that our music speaks to them is far more important. You're here next week for a show at XOYO. Have either of you been to London before? I've visited London a number of times as I used to live in Europe - one year in Madrid and two years in Paris. Did you find London very different to San Francisco? The thing that has always struck me is how diverse London is compared to most other European cities. In that way, it is similar to San Francisco, which is also incredibly diverse. You've covered Prince/Sinead O'Connor's Nothing Compares 2U. What made you choose this song for a cover? We chose this song a) because it's great, b) because we knew it would be a challenge and c) because it hasn't been covered very often. Whose previous version do you prefer — Prince or Sinead's? Sinead's version is better. I think Prince would admit that as well. 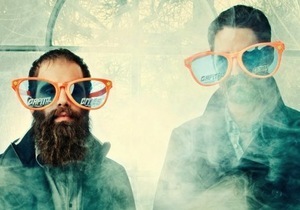 What can we expect from the Capital Cities XOYO show? And, finally — during your time here, which of the following are you most likely to do: (i) go on the London Eye; (ii) have a pint in an old-school pub; (iii) be sick on the Underground; or (iv) all of the above? Probably more likely to buy copies of OK, The Mirror and The Daily Mail to catch up on what's been going on with the Spice Girls, The Royals and various professional soccer players. Likely this reading will take place at a pub while enjoying a pint of bitter. Safe and Sound is out on 22 September and In A Tidal Wave of Mystery follows a week later (both on Capitol Records). Capital Cities play XOYO on 19 September. Tickets are available but a mouseclick away.